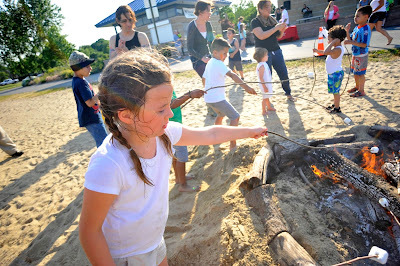 On Thursday, June 18th, Save the Harbor/Save the Bay joined the East Boston YMCA and the Department of Conservation and Recreation for the first Constitution Beach Campfire Festival of the summer! The event brought more than 60 kids and their families to Constitution Beach in East Boston to kickoff the summer by roasting marshmallows around the campfire, dancing and singing, and listening to pirate stories on the beach . Families and friends set up camp chairs and blankets to enjoy the evening and watch the sunset while DCR staff member Enzo Polcaro kept watch over the fire to ensure perfectly roasted marshmallows! Storyteller Norah Dooley describes how big her friend Herman the worm was! 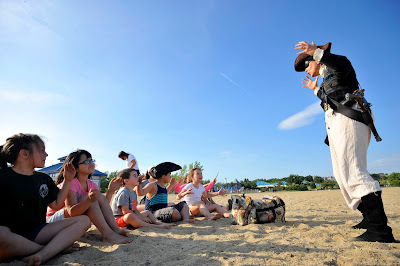 Mary Read the Pirate, played by storyteller Norah Dooley, made an appearance and gathered the kids along the shoreline to tell stories of her life as a pirate. She explained what life was like on her pirate ship and taught the kids a very important skill that all seafarers should know- how to tie a knot! Everyone practiced and practiced, and those who were able to tie a proper square knot were rewarded with a foreign coin from Mary's Pirate Booty! It was a fantastic event hosted by the East Boston YMCA and the Department of Conservation and Recreation with the support of Save the Harbor/Save the Bay's Better Beaches Program. We are greatly looking forward to the rest of the Campfire Festivals hosted on Thursday nights this summer and fall! They will be held at Constitution Beach (Zero Barnes Ave) in East Boston from 5:30PM - 7:30PM on July 16th, August 6th, September 17th, and October 15th. For more pictures from the event take a look at the video below! Stay tuned for a complete calendar of all Better Beaches Program Events happening this summer! 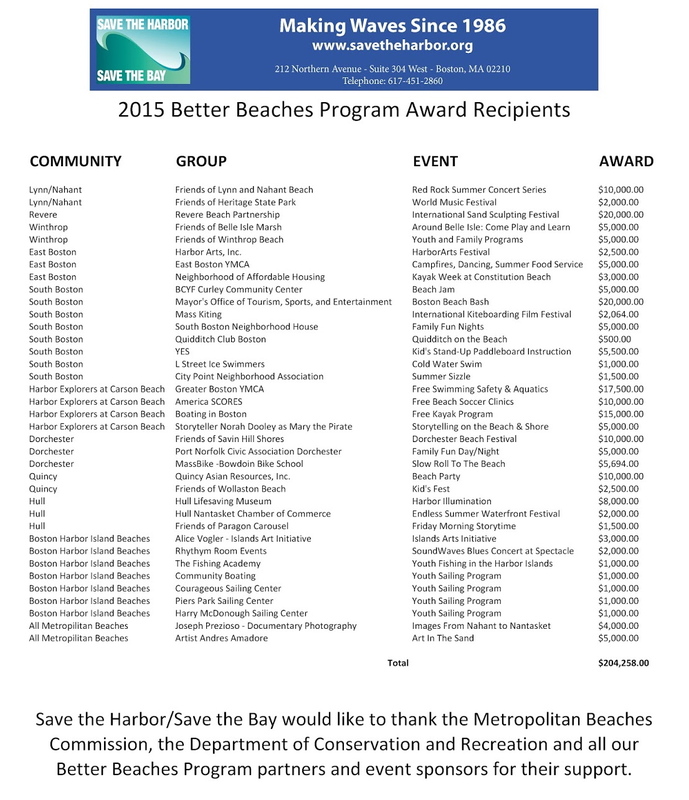 On June 6th, 2015 Save the Harbor/Save the Bay awarded more than $200,000 in Better Beaches Program grants to more than 35 different groups in 9 beachfront communities from Nahant to Nantasket to support over 70 free public events this summer. This year’s Better Beaches Program grants will fund traditional beach events like free concerts and sand sculpting competitions, family fun nights and beach festivals, including a late season beach party hosted by Boston Mayor Marty Walsh. It will also include a Quidditch tournament, story telling with the pirate Mary Read, a coastal illumination and sand painting by noted California coastal artist Andres Amadore. For more information about Save the Harbor/Save the Bay’s Better Beaches Program, see our blog post about the awards ceremony on our blog Sea, Sand & Sky here and be sure to visit our website at www.savetheharbor.org or follow savetheharbor on Facebook and Twitter. 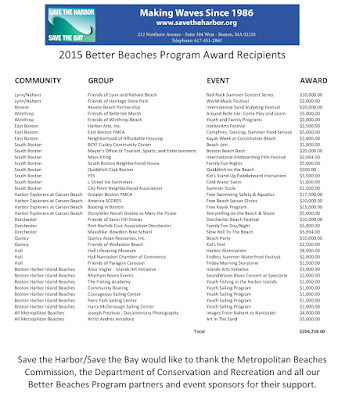 On Saturday morning, June 6th Save the Harbor/Save the Bay awarded more than $200,000 in Better Beaches Program grants to more than 35 different groups in 9 beachfront communities from Nahant to Nantasket to support over 70 different free public events this summer. (First row, from left to right) Massachusetts Department of Conservation and Recreation Deputy Commissioner Sam Overton, Metropolitan Beaches Commission Co-Chair Rep. RoseLee Vincent, Save the Harbor/Save the Bay Board Chair Joe Newman of National Grid, Save the Harbor President Patty Foley and Spokesman Bruce Berman with representatives of more than 30 groups from 9 communities who received Better Beaches Program grants totaling more than $200,000 today at Boston’s Fish Pier. 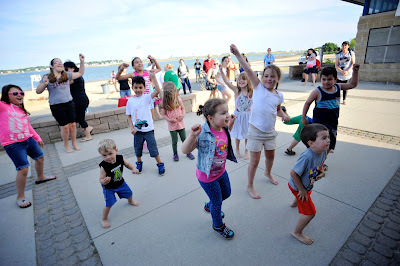 This year’s Better Beaches Program grants will fund traditional beach events like free concerts and sand sculpting competitions, family fun nights and beach festivals, including a late season beach party hosted by Boston Mayor Marty Walsh. It will also include a Quidditch tournament, story telling with the pirate Mary Read, a coastal illumination and sand painting by noted California coastal artist Andres Amadore. To view a comprehensive calendar of all the events happening on the beaches this summer, click here. Save the Harbor/Save the Bay also announced the expansion of their free Boston Harbor Explorers program at DCR’s Carson Beach in South Boston, which is now one of the cleanest urban beaches in America. The program will be based at the McCormack Bath House on Day Boulevard, and run five days a week for 8 weeks in July and August. Activities at DCR’s Carson Beach will include including free swimming and kayak lessons and beach soccer clinics, as well as environmental exploration, fishing, and art on the shore. Save the Harbor expects more than 2,000 youth and teens from area youth development and community organizations to take part this year. “The region’s public beaches are an extraordinary asset to the residents of Boston’s waterfront neighborhoods and beachfront communities from Nahant to Nantasket” said Save the Harbor’s spokesman Bruce Berman. “It was a wicked winter. We want to thank the Department of Conservation and Recreation and the Metropolitan Beaches Commission and all our program sponsors and partners for making this a spectacular summer for the more than 1 million people who live just a short ride or drive from the coast. Save the Harbor/Save the Bay launched the Better Beaches Program with the support of The Boston Foundation in 2008 to help local communities and beaches friends groups create and sustain free events and activities on the region’s public beaches from Nahant to Nantasket, as recommended by the Metropolitan Beaches Commission. 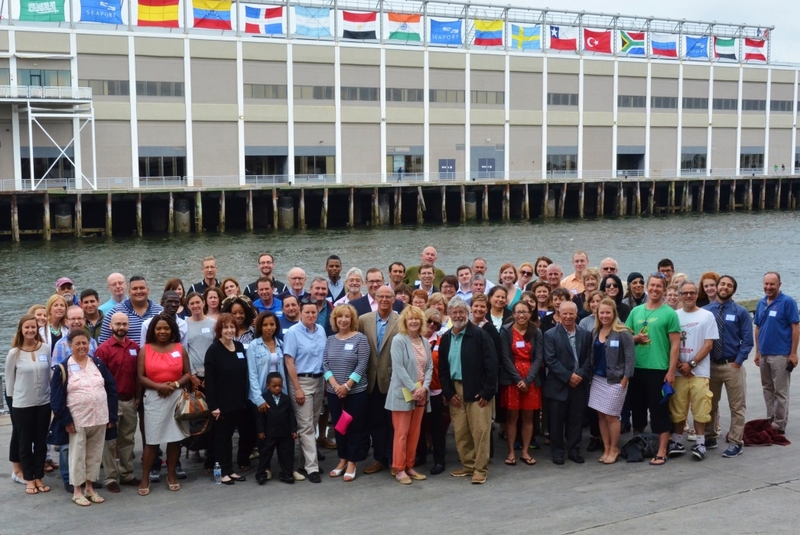 "We were proud to be there at the beginning to help found Save the Harbor/Save the Bay nearly 30 years ago," said Metropolitan Beach Commissioner Paul S. Grogan, President and CEO of the Boston Foundation. "And we applaud and support their Better Beaches Program. It activates our beaches and enhances their value to urban families, and provides another incentive for young professionals to settle in Greater Boston." “At hearings from Nahant to Nantasket we heard repeatedly that modest investments in free events and programs can put these beaches to work for our communities” said Senator Tom McGee of Lynn, Metropolitan Beaches Commission Co-Chair. Funds to support the Better Beaches Program come from the proceeds of the Harpoon Helps Cupid Splash pledge fundraiser, which was held this year on the first snowy Saturday of spring. 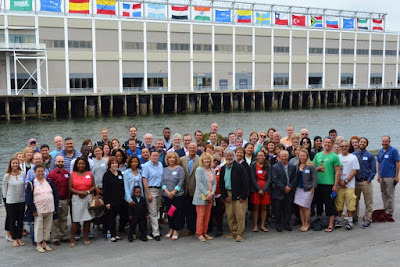 Over the past 7 years, Save the Harbor’s community partners in Nahant, Lynn, Revere, Winthrop, East Boston, South Boston, Dorchester, Quincy, and Hull have leveraged $205,000 in small grants received from Save the Harbor/Save the Bay with $815,722 in cash and in-kind contributions from local government and small businesses for a total investment of $1,020,722 in 214 free events and programs for the region’s residents and visitors alike. This year, with additional funds from the Department of Conservation and Recreation, Save the Harbor/Save the Bay awarded over $200,000 in grants to groups in Lynn, Nahant, Revere, Winthrop, East Boston, South Boston, Dorchester, Quincy and Hull. 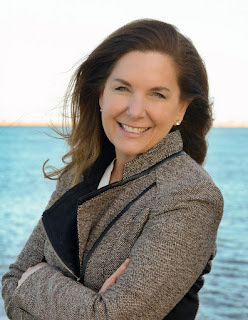 "These Better Beaches Program grants offer a tremendous amount of value by financially assisting free, public events that are both enriching and engaging," said DCR Commissioner Carol Sanchez. "By partnering with organizations like Save the Harbor/Save the Bay, DCR continues to seek different ways to make our beaches a fun, unique, and enjoyable experience." 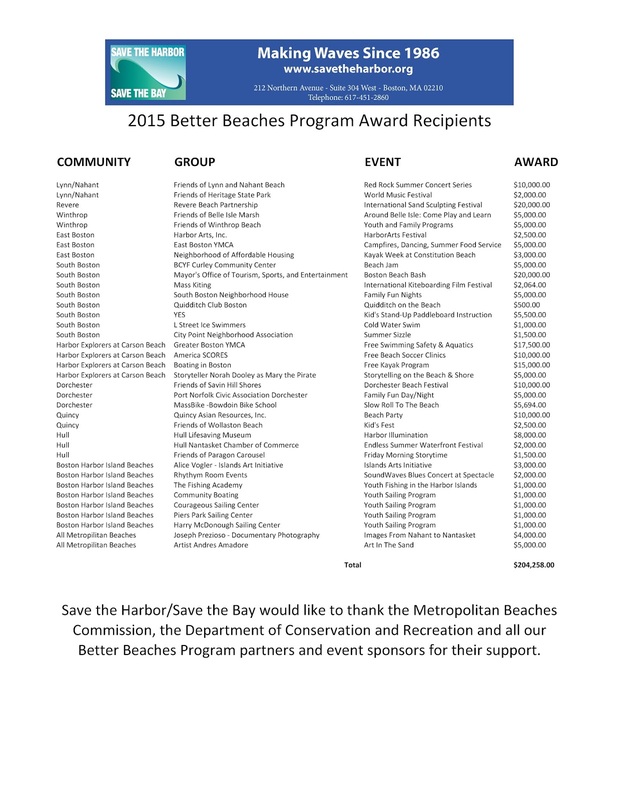 Here's the complete list of 2015 Better Beaches Program Grants. In addition to the grants given out on Saturday, each group will also given a small bag of marbles to scatter along the shore as a part of Save the Harbor/Save the Bay and JetBlue’s summer-long “Simply Marble-ous” Treasure Hunt. If you find a marble on the beach this summer, send a picture along with your contact information to Save the Harbor/Save the Bay to be entered to win a free round-trip flight courtesy of JetBlue. Save the Harbor/Save the Bay would like to thank the Metropolitan Beaches Commission and the Department of Conservation and Recreation for their support of the Better Beaches Program. We would also like to thank the more than 600 people participated in this year’s Harpoon Helps Cupid Splash, and all our Better Beaches program, policy and event sponsors, including Harpoon Brewery, JetBlue, The Boston Foundation, Harold Whitworth Pierce Charitable Trust, Richard Saltonstall Charitable Foundation, P&G Gillette, Comcast, National Grid, The Department of Conservation & Recreation, BCYF Curley Community Center, Boston Centers for Youth & Families, YMCA of Greater Boston, Food Should Taste Good, Mix 104.1, Sullivans and Russo Marine. For more information about Save the Harbor/Save the Bay’s Better Beaches Program, visit their website at www.savetheharbor.org their blog Sea, Sand & Sky at www.blog.savetheharbor.org or follow savetheharbor on Facebook and Twitter.